Storytelling is a powerful business tool. It’s available to everyone. All you need is a little knowledge, a few new habits and some practice. We are firm believers in the importance of practice -it’s why we include a six-month Deliberate Practice Program as part of our programs. 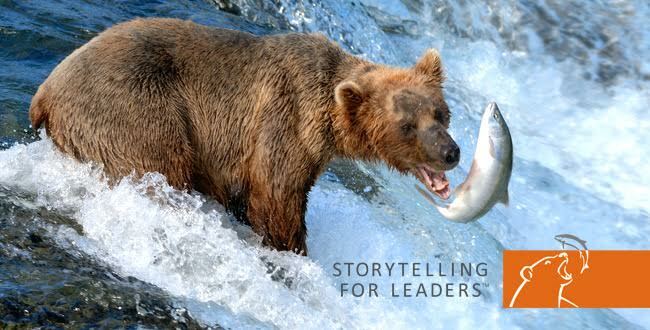 It’s also why we selected the bear and fish logo for our Storytelling for Leaders® program. Lots of people ask about the bear and fish logo. Last week was no exception. I was at the ATD 2016 conference in Denver. The conference is held at the Colorado Convention Centre which features a 10 metre high blue Grizzly Bear at the front of the building. Rosie, from Mexico City asked me to explain the bear and fish logo and when I did, she suggested I tell the story to video in front of the big blue Grizzly Bear. The video below is the result. The Association for Talent Development (ATD) was formerly know as the American Institute for Training and Development (AITD). The name was changed in 2014 to more accurately reflect the global membership of the association. ATD holds the world’s biggest training and development conference with over 10,000 attendees. One of the features of ATD is that several thousand of the attendees are from overseas – it really makes for a great vibe. I was very encouraged by the opportunities for our Storytelling for Leaders® and Storytelling for Sales™ programs – so much so that we will be exhibiting at ATD2017 in Atlanta, Georgia. Hopefully we will see you there.